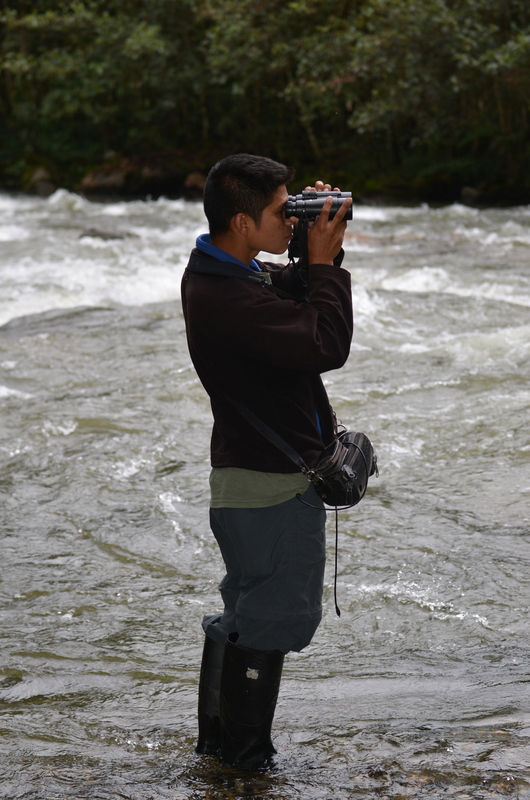 Jose looks for the Torrent Duck on our trip in the High Andes. So, I had never been on an organized tour. Usually, Steve and I do what our birding neighbors and friends call “freelancing,” which is fancy for saying that we plan our locations and lodging on our own and hire a local bird guide. I like the idea of researching everything and planning it all out. I wasn’t sure I’d like an organized tour. Would there be too many in the group? Would I be able to keep up? Would I feel trapped? But those same birding friends had such a great experience with a well-known group, Tropical Birding, in Ecuador that we thought we’d try them out. Plus, the more I visit places outside the the U.S. in search for birds, the more I find that I need help. Especially when I don’t know the language. We went on the Tropical Birding tour our second week in Ecuador. That’s when we met Jose Illanes, a tour guide/leader for Tropical Birding for 11 years now in Northwest, Eastern and Southern Ecuador, as well as Peru (Manu and Machupicchu). He also has led trips in Venezuela and has been on scouting trips in Brazil, Bolivia, Thailand, been birding in England, Holland, North America and South Africa, and as I write this I believe he’s on his way to Australia. Jose is young, but don’t let that fool you. His birding knowledge is impeccable and he can spot a Torrent Duck from the van while traveling at 40 miles an hour. And he hears birds no one else in the group hears. I recently followed up with Jose and asked him a few questions about how he got into birding and what he would recommend as tips for people who want to join an organized birding tour. Accidental Birder (AB): How did you get into birding? Jose Illanes (JI): When I was 13 or 14 years old I saw my Uncle Jose Hualinga going out and looking at birds, watching through a little hole in a scope, so I became interested too. One day my uncle gave me a broken pair of binoculars and then I began walking up and down along the Napo river bird watching, and I still remember my first bird species: the Yellow-rumped Cacique. My Uncle Jose Hualinga is still birding and works at la Selva Lodge where I joined him when I got older. It is there where I helped my uncle and met some bird leaders who now are my colleagues. By fortune I met Mr Coopmas who introduced me to the Tropical Birding crew. AB: There are different “types” of birders who go on birding tours. Who are they and can you describe them? JI: Well there are different types of birders: Some of them can be the beginner, who want to go and enjoy watching the colorful birds and wildlife; Listers, who want to see as much as they can and tick them on a list; and People, who simply like to see birds and be able to recognize them. Birders of all types are nice. It just all depends on how you adjust yourself to the clients. You must adjust, otherwise you won’t do well as a guide. AB: What 5 things should birders keep in mind when going on an organized birding tour? When you sign up for any organized birding trip you should determine what condition or shape you are in and match that to what the tour company is offering. Understand your ability and scale for birding. You don’t want hold back the rest of the people on the trip and not enjoy yourself. Respect others in the group. You never know what people you are going to meet on your tour so you need to be tolerant of everyone’s ability and level. Help each other, as the leader might not be able to help everyone on the trip if they are numerous. Most importantly, you need to respect and do whatever your leader says, as they have been doing this many times, and must have reason. It’s not because they are crazy or simply want to annoy you. Sure, we’d do it again. Did I enjoy my first organized tour? I actually did. We were lucky, though, and were part of a very small group. There was only three of us and we all were the same type: We loved just simply finding and looking at the birds. We weren’t in a hurry and even though I struggled with the altitude and the terrain, Jose was not only helpful but encouraging to me all along the way. Also, the staff at Tropical Birding was amazing. They handled everything for us and even helped us book our week at Sacha Lodge prior to our Tropical Birding tour and also helped arrange guides for Quito and for Otavalo Market so we could experience more of Ecuador. We’re hoping to do the Tropical Birding tour in Kenya in 2015. Have you been on an organized birding tour? What tips do you have? They are SO much fun! It’s such a great way to learn about the culture of other countries. Birds tell us a lot. Great information. Thanks so much for writing this up, as well as the good info you provided about birding in Panama. We went with a naturalist on an organized birding trip to Cuba, and thought it was such a great experience, we are anxious to do an organized trip again. Sue, you’ll have to tell me how you got to go to Cuba. My Canadian husband can go, but alas, I cannot. You know, because of my country and all. Lots of American birders w/ American passports go to Cuba. What you need to do is find an organized group going to Cuba that has a permit from the US Department of State. Ted, thanks for passing along that tidbit. I’m definitely going to check that out. My husband and I have been on several birding trips with Tropical Birding and found their tours and leaders great. Thanks for the interesting interview with Jose. We find small groups (8 or less) are best but have been with 14 and 2 guides before. We love the scenery and flowers so much it adds to any trip because you get out in the back country. Every once in a while we take a cultural tour but try to find birds in our free time. We’re headed for the mountain kingdoms of the Himalayas on Friday and hope to see some great birds in Tibet, Nepal, Bhutan and Thailand. Marji, you are so lucky! Husband and I have been longing for a trip to Nepal and Thailand. Would love to hear a trip report from you when you get back. Your on…especially if we see any birds! 1. Be flexible and adventourous: some people “print” the description of the tour and they will stick to it as if life was depending only and solely of what that pice of paper describes. In a group the guide will try to catter everyone on the group! The more flexibility they show they more things (birds) you may see. 2. Organize your own group: go with friends, find like-minded people or ask for special dates or departures for photographers or whatever your special interest is. Most companies will let you have a “private” guide once you have X amount of passenger of your group. 3. 8 is the magic number. Of course 3 is better but above 8 members in a party the social dynamics are just SOOOo variable! 4. Plan your plan B. Did not like the group? be prepared to scape in a decent manner with another optional tour but know them in advance! 5. Make sure the guide knows your need: very often in a group some people will be shadowed by the bold sparkling personality and they will never approach the guide to let them know that beside of the monstrous gigantic Harpy Eagle they’ve bein promised to see their actual dream is to see a Chestnut-mandibled Toucan! Beny!! Miss you!! This is perfect. Thanks for your additional tips. I especially love your Plan B approach. Hope we get to connect in November when we’re in Panama. You are SO welcome! Feel free to pass along. And we’re excited about our second trip to Panama in a couple of months. Yea!